The condition my client reported on the intake form during the interview was extremely tight shoulders with many “knots” in them. This is my own private client that I have brought in for internships. I chose this condition because I have seen it over ten times in internships. I see multiple trigger points in the upper and middle trap and cervical spinal muscles. These seem to be a very common condition. I also have many trigger points in these areas. In writing a brief summary of her condition and history, it appears that most of her trouble is coming from the middle fibers of the trapezius. My client has her own pastry chef business. So, she spends at least 6 hours a day on her feet mixing various batters and then decorating the pastries. I have watched her do her job (she’s my dear friend). I have observed her leaning over her work (flexing the neck) and elevating the scapula adducting the shoulder, flexing the elbow and flexing the digits. So this position is fine for a few minutes but she may be in this position for hours. Now, she is not complaining of back, hip, elbow, or wrist pain. She only complains of pain in that upper and middle trap area. There she presents with multiple trigger points. This is my treatment plan for my client. Locate trigger points by palpating tight bands, find the most tender spot. The explanation for why I chose this particular type of treatment. First of all, trigger points will not resolve on their own. Muscle fibers are chronically stuck in a contraction. This particular protocol is said to deactivate the trigger point by causing myosin heads to release the actin filaments. This best happens by increasing blood circulation, O2 and energy to that muscle. It’s very important to treat that taut band as well. Referral pain is thought to be in the same location and share the spinal nerve root. My expected outcome from following this trigger point treatment plan was significant pain reduction. My client reported pain at a level 7-9 out of a 1-10 scale. She had increased pain following 8 hours of cake decorating. Her ROM was within functional limits but was decreased from what it had been in previous years, particularly in shoulder flexion and outward rotation. I expected treatment to enable her to regain full ROM. Due to the pain intensity, this affected the client’s sleep, so my goal was for her to have decreased pain so she could sleep 8 hours per night. I also believed much of the trigger point formation was a result of muscle overload and repetitive use. So identifying repetitive movement so adaptive techniques to decorate cakes that might reduce the load on her upper trapezius muscle was a focus. I found two legitimate and recent research studies on myofascial trigger points and successful methods in treating them. Unfortunately, they both related to headaches which my client didn’t have. However, her trigger points were in the same place. The first one, called Trigger Point Massage Offers Headache Help, published in the Clinical Journal of Pain. I want to talk about their specific treatment and the outcome. They started with 15 minutes of myofascial release to back, shoulders, chest, and neck. Followed by 20 minutes of trigger point release to upper traps, suboccipitals, and the SCM. The last 10 minutes of each massage consisted of post-isometric relaxation, directed right and left lateral cervical flexion, circular or cross fiber friction at the masseter, temporalis and occipitofrontalis muscles as well as gentle effleurage and petrissage to neck and shoulders. I was not able to find specific numbers in the research paper. However, the results published was a greater perceived reduction in head pain among those who received massage as compared to those in the placebo group. The conclusion of this study was that the massage techniques significantly reduced the headaches people were experiencing. The researchers also hypothesized that the massage techniques, particularly the trigger point release, was the main factor in the reduction of pain. I treated my client 3 times, three weeks in a row. I followed the procedure as above. I always took time to warm up her tissues before performing trigger point release. By the third session, her pain was reduced to a level five. She was sleeping eight hours a night. Her shoulder flexion had improved significantly. The shoulder external rotation was still somewhat limited. We talked about several adaptive techniques that she could use to change her position. I really don’t think she seriously considered any of my suggestions. My client is a 43-year-old female, and she presents with chronic tension headaches which are characterized by pain and pressure on the sides of the head, particularly on the left, and tenderness in the neck and shoulders. In addition to pain, her symptoms cause her stress, anxiety, insomnia, and mood disturbances. She also often resorts to pain medication, which causes rebound headaches when she tries to stop using them. She also presents with a kyphotic curve in the upper thoracic region with typical accompanying tightness and pain, severely reduced range of motion, and gait challenges, and neurological symptoms like spasticity. I chose this client because her condition is severe and traumatic for her, and I want to use massage in addition to intervention with exercise and therapeutic movement that I use with her as a client in my practice. The Mayo Clinic defines chronic tension headaches1 as headaches that last for more than 3 days or occur for more than 15 days per month, and include symptoms such as dull, aching head pain, pressure or tension in the forehead, sides, or back of the head, and tenderness in the neck, shoulders, and scalp. This client believes, and my experience supports, that her condition relates to both structural issues in the thoracic spine, cervical spine, and shoulder girdle due to postural distortion, as well as traumatic life events that contribute to certain muscle memory and “holding patterns” that keep her in what I would describe as “fetal” posture. She has also had breast and gluteal implants, which contribute to her structural issues. My plan included a combination of exercises, assisted stretching, and researched, targeted massage techniques that employ a gentle approach to “unwinding” her challenges. She has been relying exclusively on deep tissue work, and I want to test the gentler methods. My goal with this client was to decrease the severity, duration, and frequency of her headaches. After the first treatment, she reported a migraine headache, which she felt was triggered by the “limited attention” that her muscles were given, and the lack of deep tissue work. I was a little discouraged but hopeful that we would achieve some results with time. She allowed me to continue, and after week 2 she reported not only one day totally headache free, but also that she was able to get a good night’s sleep without the use of medication. Week 3 was interrupted by her work travel, and then when she returned she received botox injections throughout the head and neck to treat the headaches. She had received these injections a little over three months ago and was pleased with the results for the first two months. The headaches resumed in month three, and she was desperate for more significant relief. While I was disappointed that the case study was interrupted by the intervention, I am glad that she is feeling better and that I got to see the promising results of the effect of these targeted therapies on chronic tension headaches. I will continue using the protocol with her, as she has come to enjoy it, and the new test will be to see if we can get her through the third month post botox treatment. (3 minutes) included bilateral pressure moving from the lower cervical region to the occiput. This procedure was repeated, with completion of 3 passes bilaterally. (5 minutes) included 3 palmar glide passes each over the deltopectoral, deltoid, and posterior deltoid regions bilaterally. Additionally, 3 passes with a soft fist contact were made from the occiput to the lateral shoulder along the upper trapezius bilaterally. (2 minutes) included application of manual axial traction with 1 hand under the head and neck and the other hand on the forehead. Gentle traction was applied with the head first slightly flexed, then with slight right lateral flexion, and finally with the head in slight left lateral flexion. Traction was held for 15 seconds in each position. (15 minutes) consisted of scanning palpation of the upper trapezius, sternocleidomastoid, suboccipital, splenius capitis, levator scapulae, and temporalis muscles to locate and manually treat trigger points. When located, active trigger points were treated by pincer or flat palpation with just enough pressure to elicit referred pain or autonomic referral phenomena. That pressure was maintained on the trigger point until the client reported that the referral pain had dissipated or for a maximum of 2 minutes. Pressure on the active trigger point was then slowly eased to elicit a vascular flushing. This procedure was repeated 3 to 5 times on each trigger point. Typically, 6 active trigger points were treated in the time allotted. (5 minutes) consisted of muscle energy techniques, which included therapist-assisted lengthening and stretching of the cervical paravertebral musculature. The stretching procedure invoked relaxation through reciprocal innervation mechanisms. The antagonist musculature was isometrically contracted; this was followed by passive stretching of the agonist musculature. My client, Claudia (name changed for the sake of this study), came in for a general relaxation massage and listed scoliosis, kyphosis, and arthritis in her wrists and hands as areas of concern that may require modification for the session. 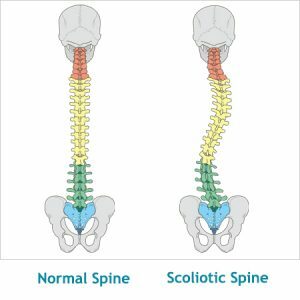 I am going to focus on the spinal abnormalities of scoliosis and kyphosis for the sake of this case study, as I feel that these spinal conditions are fairly common, but I have not had a client with these issues before and wanted to spend some time reflecting on how I can best serve clients like Claudia in the future. During the assessment, Claudia stated she has had scoliosis and kyphosis diagnosed since the age of 15 and causes her minor issues, namely backaches and compensatory tension in her shoulder, especially the right one. Her arthritis started in her 30’s and has been well managed with medication since then. I mention this because of her current use of corticosteroids (prednisone) and the contraindications that are necessary due to her medication. She stated that pain and stiffness were a minor issue and that there were no tenderness or sore spots to avoid and requested deep pressure for her session. Structural scoliosis is a lateral curvature of the vertical line of the spine, often caused by vertebral rotation, usually in the thoracic section of the vertebral column, and often develops in childhood to puberty. From a conversation with Claudia, I am fairly confident her scoliosis is idopathic, as it is not hereditary and did not develop aften an injury or other diagnosis. Scoliosis is often expressed visibly through uneven shoulders, over prominence of one scapula or the other, exaggerated curvature of the spine, uneven hips, or other abnormal structures in the axial skeleton. Common symptoms include muscle spasming-especially around the spine, back pain-usually thoracic to lumbar region, compensatory actions of surrounding muscles leading to referred pain patterns, uneven structural muscles, headaches and insomnia. Kyphosis is similar to scoliosis in that it is an abnormal curvature of the spine. Kyphosis, however, is an exaggeration of the kyphotic curve in the thoracic spine due to an abnormal or wedge shape to the vertebrae, whether through abnormal growth, degeneration or injury. I am unsure whether Claudia has postural or Scheurmann’s Kyphosis as she did not specify, but am fairly confident it is not congential as she did not start showing signs of hyperkyphosis until adolescence. Kyphosis is not always visible when present, but often is seen expressed through a hump in the upper back, a depression or caving of the chest or an appearance of bad posture. In addition to the symptoms I listed for scoliosis, kyphosis can also cause weakening of muscles in the upper back due to overstretching, balance disorders, shortness of breath, and potential compression fractures due to stress on weak portions of the spine. My treatment plan for kyphosis included effleurage, petrissage and friction of the pectoralis major, pectoralis minor and serratus anterior to aid in opening up the chest and allowing relief on the rhomboids and trapezius. Compression and gentle parallel-fiber friction of the scalenes and sternocleidomastoid, and trigger point work on the upper trapezius and rhomboids to aid in balancing and proper alignment of the shoulder girdle. To address her scoliosis, myofascial release and deep stripping of the iliopsoas, quadratus lumborum and paraspinals to relieve lower back tension and pain. Myofascial and stripping of the erectors–namely longissimus and ilioocostalis, and gentle traction pulls on the legs to aid in spinal alignment. I chose these components for my treatment plan as my goal in this session was to promote relaxation, relieve unbalanced tension and work towards better structural alignment by releasing muscles locked around the areas of deformity on the spine. I executed these actions with a moderate pressure and conservative, focused deep pressure on trigger points to achieve release. I avoided deep friction and heavy compression around bony areas, as side effects of corticosteroids include thin skin, increased bruising, high blood pressure, and osteoporosis, and I wanted to avoid any harm done to my client. I knew the session was not going to have magical results, as her spinal deformity is a lifelong structural issue and the body had deeply habituated holding patterns. My goal was not to resolve these issues, but to provide left to right balance and tension relief to Claudia. During assessment I noticed her right shoulder sat superior and inwardly rotated in comparison to the left (due to a right lateral curve of her scoliosis), causing the right scapula to protrude from her back more prominently. I wanted to even these out, providing relief to upper back and shoulders, increasing mobility. Also, my goal was to relieve lower back tension and compression of the joints through leg pulls, traction, compression away from the midline and mobility stretches of the hips. I was successful on all counts but one. I provided a relaxing experience to my client, I was able to get multiple releases through trigger point work in her right supraspinatus and levator scapula, causing the right shoulder to balance with the left on a horizontal line, I provide relief of pain in the hips and lower back, but was not successful in aligning her scapulae when assessing her back in the prone position. I think this was partially due to her condition, but also could have been further improved if I had spent more time working on releasing holding patterns on the anterior side of the body, such as pectoralis minor, pectoralis major and sternolcelidomastoid to allow more equal tension from anterior to psoterior. I found multiple studies online supporting the treatment plan I chose to use, stating that regular bodywork focusing on the muscles surrounding the spinal deformity could cause structural change over a long-term treatment plan. Myofascial release, deep stripping, positional release techniques and traction were listed as the most successful techniques to use in non-hereditary, non-congenital scoliosis and kyphosis. Dalton, Erik. “Symptomatic Scoliosis.” Massage & Bodywork (April/May 2006): n. pag. Web. 22 Dec 2016. Prideaux, Sally. “Common Postural Problems-Kyphosis, Lordosis and Scoliosis.” You Massage Therapy (January 2012): n. pa. Web. 22 Dec 2016. The condition your client reported on the intake form or during the interview. Fibromyalgia and Sjogren’s syndrome. The diagnosis has not been definitive. There may be overlap. Or it may be one or the other according to his doctors. Why you chose to write up this case report–why this condition or client. The client is my brother-in-law. He lives in Austin and I live in Fredericksburg, so the frequency with which I have been able to work on him has been once per month. Still, I have had access to him more than any other client with a condition (other than just the usual complaints of muscle tightness). The client suffers from muscle aches/pain, chronic fatigue, dryness of eyes, mouth and nose. The pain and inflexbility in the joints, his doctors believe, is from the Sjogren’s, which is believed to be a genetic predispostion. (His mother suffered from similar symptoms that suggested she had Sjogren’s, but it was never medically diagnosed). He suffers from gastrointestinal issues (constipation and bloating). Finding it difficult to sleep is also a problem. Because he has gradually limited his interactions with others, and essentially isolated himself, he is also being treated for clinical depression. Your understanding of the conditon – the causes, symptoms, pathology, etc., that are relevant. Fibromylagia is not a psychological condition. While the exact cause is still not known, it is believed to have a biological cause. Recent research suggests that changes in the central nervous system (brain, spinal cord, and nerves), may be responsible. It is believed that there may be a number of factors working together. Physical and emotional trauma have been linked to fibromyalgia. The genes you inherit from your parents may increase the likelihood of developing fibromyalgia (a family hsitory). There is some evidence to suggest that certain illnesses can act as a trigger (infections). People with autoimmune diseases, such as rheumatoid arthritis, are more likely to develop fibromyalgia. There are still many aspects of fibromyalgia that are not understood. Because of the complexity of the condition, it can be difficult to diagnose. But an accurate diagnosis is critical in managing these cases. If the condition is not diagnosed and treated early, symptoms can go on indefinitely, or they may disappear for months and then recur. Fibromyalgia involves widespread muscle pain and tenderness. It is a chronic condition that can last for years or be a lifelong issue. It can’t really be cured but treatment may help. Symptoms include chronic muscle pain, muscle spasms, or tightness, moderate or severe fatigue and decreased energy, insomnia or waking up feeling just as tired as when you went to sleep, stiffness upon waking or after staying in one position for too long, difficulty remembering, concentrating, and performing simple mental tasks (“fibro fog”). Other symptoms include abdominal pain, bloating and constipation alternating with diarrhea (irritable bowel syndrome), tension or migraine headaches, jaw and facial tenderness, sensitivity to one or more of the following: odors, noise, bright lights, medications, certain foods, and cold. The individual may be feeling anxious or depressed, and experience numbness or tingling in the face, arms, hands, legs, or feet, increase in urinary urgency or frequency (irritable bladder), reduced tolerance for exercise and muscle pain after exercise, and a feeling of swelling (without actual swelling) in the hands and feet. Fibromyalgia symptoms may intensify depending on the time of day (morning, late afternoon, and evening tend to be the worst times). Symptoms may also get worse with fatigue, tension, inactivity, changes in the weather, cold or drafty conditions, overexertion, hormonal fluctuations (such as before periods or during menopause, stress, depresion, or other emotional factors. Like Fibromylagia, the cause of Sjogren’s syndrome is unknown. Researchers think that a combination of environmental and genetic factors determines who develops the disease. While there are certain genes that increase a person’s risk for Sjogren’s, the genes do not act alone. It is believed that in order for a person to develop Sjogren’s, the immune system must be activated by some sort of trigger, such as a viral or bacterial infection, that sends the immune system into overdrive. The signs and symptoms of Sjogren’s syndrome, to some extent, overlap with fibromyalgia. Dry eyes and mouth (also known as sicca syndrome) are the most common signs of Sjogren’s, but the disease may affect other parts of the body. It can also cause swollen or painful joints, muscle pain or weakness, dry skin, loss of sense of taste, rashes, brain fog (poor concentration or memory), numbness and tingling sensations in the arms and legs due to nerve involvement, heartburn, kidney problems, and swollen lymph nodes. My intent is not to exacerbate my client’s symptoms by being too aggresive. So pressure and intent principles are taken into consideration. I will work lighter and gentler instead of deeper. Massage has shown some benefit for relieving pain, improving the quality of sleep, improving mood, reducing anxiety, all with an emphasis on good self-care. If I decide to massage my client during a flare-up, gentle pressure is all I can use without worsening the condition. Also, I need to be aware of increased tenderness in and around the spine. Since Sjogren’s can lead to joint pain and inflexibility, gentle stretching can be helpful, but I want to keep it within a pain-free range so as not to cause further injury. Also, Sjogren’s can make it uncomfortable to lay in a face cradle because of the dryness in the eyes, nose and mouth. When working on the client, I always keep bottled water on hand because remaining hydrated can lessen the severity of some of the symptoms. As with all chronic pain conditions, I’m aware that clinical depression and chronic pain go hand in hand. His doctors have encouraged him to attend group therapy sessions for people suffering from fibromyalgia/chronic pain. My client’s sedentary liefstyle (as an at-home computer programmer), also adds a difficult component to any treatment plan. I have encouraged him to attend gentle stretching classes for example, tai chi, yoga or chi gong, to try to improve circulation and possibly help with the depression brought on by his condition and lack of contact with the otuside worls. Presently my client is only taking antidepressants because he has been allergic to all of the other standard medications. The explanation for why you chose that treatment plan — justification. I believe gentle massage will be beneficial for his condittion. Gently working and relaxing the muscles while increasing circulation should provide symptomatic relief. The expected outcome from your treatment plan. My desire is to offer my client symptom relief and, as a result, hopefully affect, in some manner, the anxiety and depression. Realisticaly, that is all that I believe I can hope to achieve. Research synopsis from a massage journal, article or research site that supports your treatment plan for this condition. This article was an overview of fibromyalgia’s signs and symptoms and the indications and contraindications for massage therapy. It discussed the various techniques, how to utilize them, and what bodyworkers need to be aware of when handling clients with fibromyalgia. Also covered were the biopsychosocial implications of the condition. Sometimes massage helps the client and sometimes it has no significant effect. I’m not able to work on him often enough to note any real change with his condition, so we just go for temporary symptomatic relief. He states that following massage sessions, he usually sleeps better that night. In my client’s case, the chronic pain, stiffness and other symptoms, has led him to isolate himself to some extent. Personal time and attention help relieve the sense of detachment from a lack of human contact. He has stated that just knowing someone cares enough to try to help and to understand what he is going through, can and does provide relief. Appropriately cited reference for research material. Massage for Fibromyalgia: A Therapist’s Point of View. Sharon Muzio. The National Fibromyalgia & Chronic Pain Association. Treating Fibromyalgia: Massage Therapy as a Beneficial Tool. Ross Turchaninov and Boris Prilutsky. Massage & Bodywork Magazine, February/March 2004. 5 Benefits of Massage for Fibromyalgia Patients.Jimm Gialelis, L.M.T., B.C.T.M.B., Massage Magazine, May 11, 2016. Issue 06. Dry Eyes, Dry Mouth: Sjogren’s Syndrome. Ruth Werner. Massage Today. June, 2009, Vol 09, Issue o6. Fibromyalgia: Massage Techniques. Institute for Integrative Healthcare. Nicole Cutler L.Ac., Jan 24, 2006. My client suffers from pain in the neck, upper back and shoulders. He finds himself hunched over and has lost two inches in height over the last few years. He would like relief for the pain and help in improving postural distortion. The case study is relevant in a wider context, because many clients come with identical complaints. In our society, a hunched over posture is very common due to standard daily activities – most clients spend lots of time on smartphones or computers, drive a car for at least an hour or two per day and sit at a desk for work. Even those who do not sit at a desk often do some type of work that involves rolling the shoulders inward to “do work” in front of them (landscapers, chefs, cleaning personnel, cashiers…the list is endless). Holding the body in this posture keeps the muscles of the neck, chest and back in constant contraction or elongation, a condition for which the body arguably was not designed. This can cause pain and spinal distortions and can lead to other conditions as a result of the dysfunctional posture. Tightness in right latissimus/quadratus lumborum area and/or weakness in right anterior internal obliques could possibly be causing right iliac anterior rotation. The abduction and lateral rotation of the same side leg might indicate tightness in gluteus medius or minimus, while the elevation of the opposite (left) side gluteal fold might indicate tightness in the gluteus maximus on the left side. Client complaining of pain in neck, in sub-occipital region, in back of shoulders, upper back and rhomboid area, as well as headaches, jaw pain and periodic numbness or tingling in the arms and hands. During the client interview, I discover that the client has had multiple car accidents, shoulder and ankle injuries, all or some of which may be contributing to the postural distortion. He often feels as if “his head were on wrong”. All of this may need to be addressed in a long-range plan. 1985 (age 4) – was involved in a car accident in a pickup truck with a front bench seat, during which the truck was hit head-on by a drunk driver driving 60mph. The seat belt broke so the client fell down toward the floorboard and hit his head on the dashboard. The client suffered a concussion, an injured pelvis (numbness in pelvis, hip imbalance later in life) and neck injuries. A chiropractic evaluation at the time determined that C1 and C2 were out of alignment. The client reported anxiety later in life, which he believes is related to the accident. 2016 (May, age 35) – the client was involved in a rear-end collision. His car was hit from behind, with the other car going approximately 20 mph. Immediately after the accident, the client reported a stiff neck. He was treated the same day by a chiropractor, who realigned C1 and C2. Over the next few days, his previous whiplash symptoms resurfaced: pain and swelling in the sub-occipitals, blurry vision, followed by depression and anxiety for 6 weeks, hands continually going numb and the inability to concentrate. 2016 (July, age 35) – the client was involved in another rear-end collision. His car was hit from behind, with the other car going approximately 30 mph. This time he did not seek medical treatment, but reported similar symptoms; swelling in sub-occipitals, headaches, blurry vision, TMJ and depression. 2010m – Crossfit, while performing overhead squat with 135 lb bar, his arms overhead with elbow locked, his right shoulder gave out. His elbow bent and the client felt pain around the superior lateral border of the scapula. He has been a basketball player for all of his life, but after the injury feels a stabbing pain when he releases the ball. The pain is not as he lifts the arm in shoulder flexion, but specifically when he extends the lower arm from the elbow to push the ball, on the right side. The client recently used a very heavy garden tool to break up sod while gardening and felt pain with a similar movement. He felt the pain while driving the tool downward as opposed to up, specifically when extending lower arm to drive tool down into the soil. My observations: There could be a problem with the supraspinatus tendon from the original injury or possibly a triceps tendon impingement. The client reports pain when I press in both of the tendon areas. While all of these injuries and accidents have clearly contributed to the postural distortion, I will begin by addressing the basic structural dysfunction that is generally believed to cause head forward syndrome. This will address his original complaint of pain in the shoulders and neck, his hunched over posture and some of the other symptoms I observed, like the limited range of motion in his head and the shallow breathing. Head forward posture is widely credited to have been discovered by Dr. Vladimir Janda in 1979. He defined what is now known as “Upper Crossed Syndrome.” It is a muscle imbalance pattern denoted by tightness in the chest and back of the neck and weakness in the front of the neck and lower back. Clinically, there is a crossing pattern through the shoulder that looks like this: tightness in the upper trapezius, levator scapula and suboccipitals on the dorsal side, crossed with tightness in the sternocleidomastoid, pectoralis major and pectoralis minor on the ventral side. Since the tight muscles are continually contracting, the weakened muscles are in a perpetual state of stretch. As they are trying to hold the body up against the force of the tighter muscles, they are in a constant state of eccentric contraction. A widely accepted theory states that trigger points develop in muscles such as these which are continually contracting, which causes the client to feel pain in these areas and areas of referred pain. My client reports pain in many of the areas designated as trigger points and referred pain areas for Upper Crossed Syndrome, including the side of the face, jaw, sub-occipital region, upper back and rhomboids. He also displays several symptoms indicative of Upper Crossed Syndrome, including shortness of breath, decreased range of motion of the head and hand numbness. The plan is to stretch the muscles which are locked short, combined with releasing some of the trigger points and later activating the muscles that are locked long. Exercise at home will be critical to activating those muscles. Over the last few massages, I have been warming and massaging the pectoralis muscles first to release them, including skin rolling, deep effleurage, compression and passive stretches. In addition, I have been working on releasing the sub-occipital muscles through positional release, deep friction and compression. I have also incorporated some passive stretching of the neck, focusing slightly more on the right side, as that side appears to be more contracted. 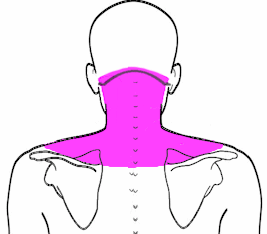 The upper trapezius has also been a focal point for deep effleurage and compression. I have also made sure to massage the trigger points in the muscles that are lengthened, specifically the rhomboids and lower trapezius. After addressing the trigger points, I massage these muscles with effleurage strokes in the direction of their origins in order to avoid further elongating them. Finally, I have given my client some exercise suggestions in order to strengthen and reactivate these muscles. The goal is for my client to get some relief from his pain and to slowly begin to release the tightened muscles. As he is able to do this, the overstretched muscles should be able to slowly return to their original length; doing the exercises at home should help him strengthen them, which will help the healing process. According to research, manual manipulation of the tissues is not as effective as manual manipulation combined with exercise. In randomized trials, it has been found that the use of these multiple modalities has resulted in a decrease in pain and increase in client satisfaction. After multiple massages, the client has slightly increased range of motion in his neck and his shoulders. He reports a decrease in his pain symptoms, and his chest appears slightly more elevated with the shoulder slightly less protracted. The change is subtle, but noticeable both to me and my client. We will continue to address his Upper Crossed Syndrome, while slowly adding in therapies to address the related issues of whiplash and the shoulder injury. Gross, A., Kay, T., Hondras, M., Goldsmith, C., Haines, T., Peloso, P., Hoving, J. Manual Therapy for Mechanical Neck Disorders: A Systematic Reviw., Manual Therapy, 2002. Why I chose this client/condition? Ankle sprains are a common injury for any person and this was the only condition that I came across that required some further research. Summary of client condition: The client was playing soccer when his left foot planted awkwardly causing his ankle to roll out, injuring the lateral ligaments, specifically the anterior talo-fibular ligament. The injury occurred three weeks prior to his massage. He did have quite a bit of swelling and bruising following the injury, but that had almost completely resolved except for some minimal swelling. The ankle was not painful at the time of the massage. He had been elevating the foot and ankle as well as taking over-the-counter anti-inflammatory medications, was wearing an ankle sleeve and modified his activities since the injury. He mentioned that he has sprained his left ankle a couple of times over the past ten years and it is a bit lax. My understanding of the condition: An ankle sprain occurs when at least one ligament surrounding the ankle joint tears or stretches beyond its capacity. This can happen in many different ways, such as walking on uneven surfaces, rolling and twisting the foot while playing sports or landing awkwardly after jumping. Symptoms of ankle sprains include swelling, discomfort/pain, possible bruising and instability. There are different grades of ankle sprains, Grade I (mild), Grade II (moderate) and Grade III (severe). A doctor can determine what Grade sprain it is with a physical exam. The client most likely had a Grade II sprain of his left ankle since he did have some mild laxity. His pain, swelling and brusing had pretty much resolved by the time of the massage. The best treatment for a sprained ankle is to, initially, elevate and ice the ankle and take anti-inflammatory medications. Immobilizing the ankle joint is an option, too, if there is any instability. If the pain, swelling and brusing do not seem to improve after a couple of days, it would be best to see a doctor. The client said that he had done all of this treatment so far, although he did not see a doctor because he was improving. My treatment plan: Since my client’s left ankle sprain had improved and he was having minimal swelling and tenderness, I decided to do a normal, Swedish massage on the client including the ankle. In regards to his left ankle, I did effleurage over the area to promote blood flow and then did some friction over the anterior talo-fibular ligament, which stimulates healing of the ligament while preventing scar tissue from forming. I also did some very gentle range of motion of the ankle, but avoiding any stretching. Following the massage, I taught the client how to do some friction massage to the area on his own and advised him to try to do this at least a couple of times per day. I suggested that he continue to elevate the ankle if he notices swelling and to wear his ankle sleeve if it feels unstable. I thought it was too soon for him to get back into playing soccer, but told him to wear support over the ankle if he felt ready to get back into exercising. He was also advised to schedule another massage with me in a week or two. Research article: I found an article titled Ankle Sprains: Principles of Orthopedic Massage and their Application on massagetherapy.com, which was written by Ben Benjamin and was initially published in Massage & Bodywork magazine in the February/March 2004 edition. The article discusses, in detail, how ankle sprains occur and what all happens to the ligaments in these types of injuries. It also goes into detail how bones and ligaments all work together to provide stability as well as movement and how important it is that ligaments not be too lax. The importance of a therapist developing the ability to assess which ligaments are involved with the injury is also an important topic in this article. The author even includes a couple of possible tests that can be helpful with this. He goes on to discuss how scar tissue can occur following ankle sprains and the best way to avoid this from happening is to work on gentle range of motion exercises as soon as it is tolerable. The article ends with a discussion of how deep massage and friction therapy can be very effective in treating ankle sprains. I learned that friction can promote healing of the ligament while it is also helping to keep scar tissue from forming. Expected Outcome: I expected the client to continue to improve as long as he continued with the treatment he was already doing. His swelling and tenderness should completely resolve and he should be able to get back to doing his regular activities with no restrictions, even playing soccer again. Actual outcome: The client did not ever come back for another massage, but I was able to touch base with him to follow up on his condition about two weeks following his massage. He said that his ankle was doing much better and that the friction massage that I showed him really did help. He noted that he continued to have swelling, but that his ankle was pain-free. He was getting back into soccer and, so far, the ankle was doing well. He does wear an ankle sleeve while exercising or playing sports for support.